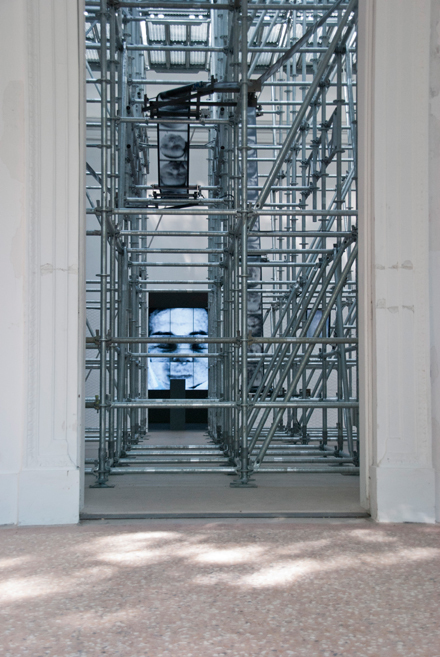 “Chance” is French artist Christian Boltanski‘s installation at the French Pavilion of the Venice Biennale 2011. 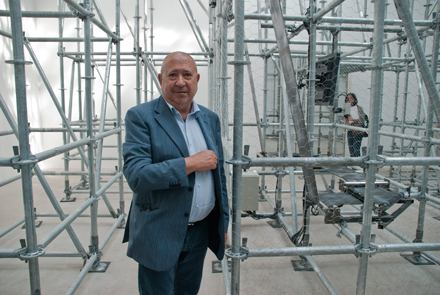 Born in Paris in 1944, Boltanski is known for his sprawling, existential projects. 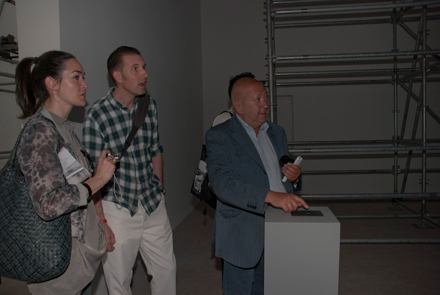 The exhibition is curated by Jean-Hubert Martin, former director of the Centre Pompidou. The artist sat down with Art Observed to talk about life, death, optimism, and Venetian cuisine. 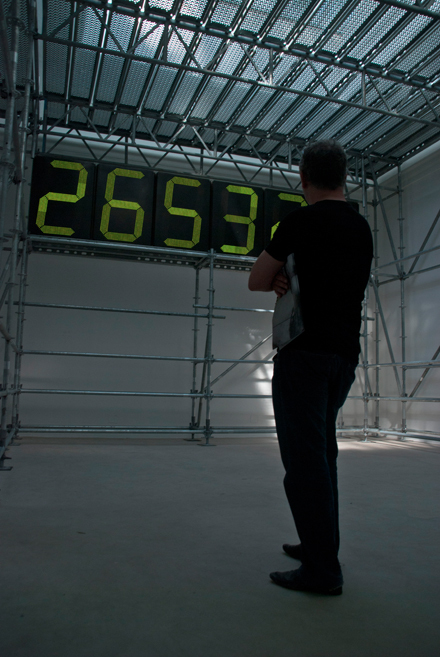 The visitor then encounters two side rooms: one consists of a digital clock counting the constantly rising world population, the other is a large mural of video screens featuring different segments of human faces. Visitors can try their luck in pressing a pause button. Like a slot machine, there is the potential to achieve three matching sections of the face and in so doing, “win” the image. 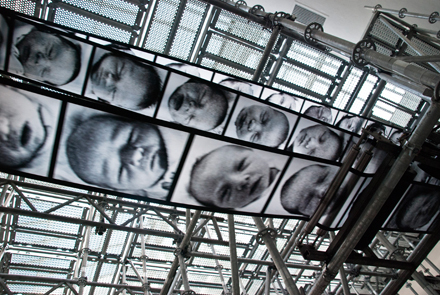 Taken as a whole, the installation reminds visitors that although we as individuals are not replaceable, we as humans will be replaced. Art Observed: Maybe we should began by asking a question that no one has asked you? 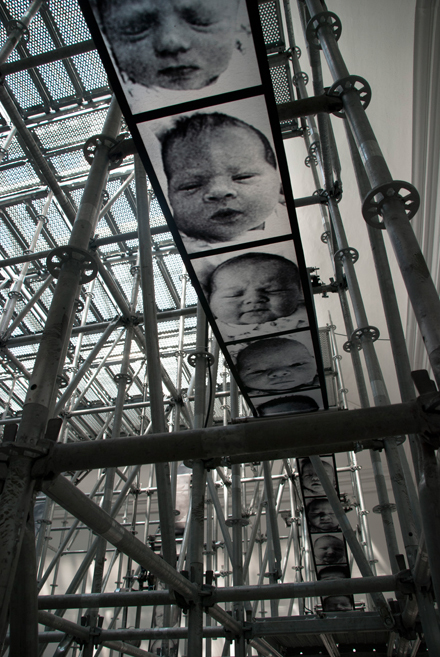 Christian Boltanski: Do I like spaghetti? Actually, what I really like is “the Morue Vénitienne” (a Venetian style cod). AO: (Laughs) Ok! You have referred to the Biennale as a carnival. Can you elaborate on what you mean by that? 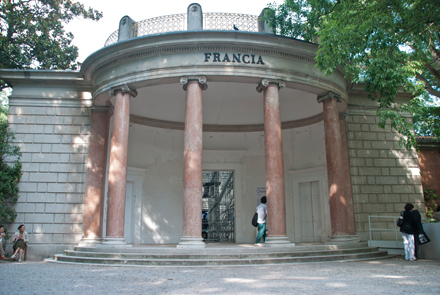 What is really specific to the Venice Biennale? 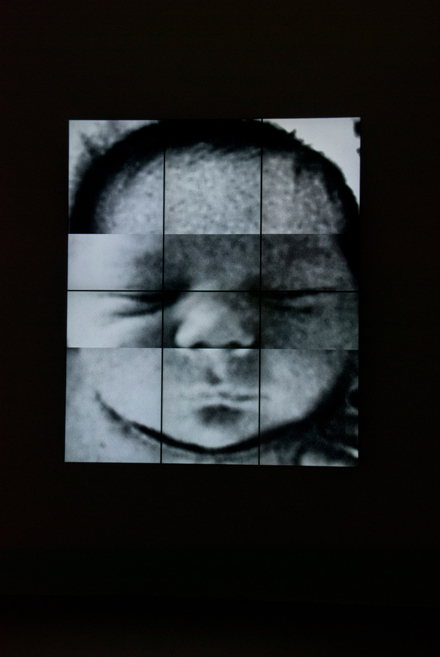 CB: There is something which is difficult for an artist – that the biennale is the king of big parties. And so, people come to see some art but a lots talk and gossip about events, asking each other if they have been invited to this party. So, I believe this is not the place where there is the biggest concentration of art to see. However, everything is what it is and artists would not make the same artwork here that in the Tate or at the Grand Palais. On the other hand, there are two publics. There is one for the opening and one more faithful – people who will regularly follow the Biennale, pay attention from the beginning to the end. 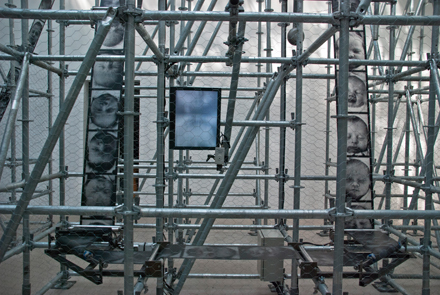 AO: The work you are exhibiting at the Biennale is more joyful than some of your previous work. Does it relate to the location, to Venice? CB: When I began to work on this project, the light was very important. I wanted to leave the door open at the entrance. For me, Venice is very playful and so the question of hazard and doom I am always asking is transformed here into something more optimistic. On one hand because more older I get, happier I am. 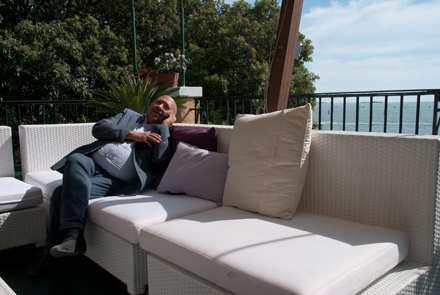 On the other hand because the Biennale is for me also a place of happiness. AO: In 2009, Australian millionaire David Walsh commissioned you to make a piece in which four cameras film your studio in suburban Paris and live stream it to a cave in Tasmania. The cameras will roll 24/7 until your death – the longer you live, the more Walsh will have to pay for the work. How did this deal come about? CB: David Walsh is a man who won everything by the game and he maintains that he never loses anything. He has the role to conserve the piece– this is my ultimate artwork, as it is going on until my death. And the funny thing is, I sold him the artwork by arranging monthly payments over eight years. If I die in less than eight years, he will win because he won’t need to pay the entire sum… So he told me that he felt he was going to win this time again and I will die in less than eight years because he never loses anything– certainly not money! AO: In english, “Chance” means luck, but there is also an element of danger. CB: Yes it means a bit of both, it is about both hazard and destiny. 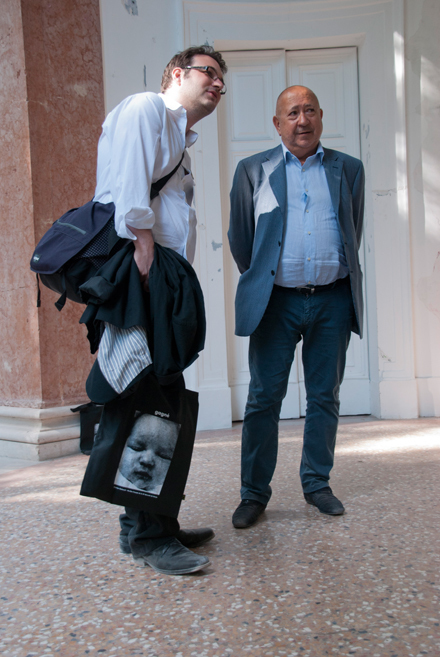 AO: Are you happy with your exhibition at the Biennale this year? CB: Yes. What I am interested in is that, this year some pavilions are far away from the market – such as Germany, Swiss, British. It gives another way of approaching art. AO: We are still always confronted to the the death within your work. AO: Is this something that scares you? CB: Absolutely not, I think it is the best way to think and be happy. Magasin 3 Stockholm Konsthall curators Tessa Praun and Richard Julin look on as Christian Boltanski presses the button. “Chance” is a joint production between The French Institute, the National Centre for the Fine Arts (Centre National des arts plastiques / CNAP), the Directorate General of Artistic Creation (Ministry of Culture and Communications) and is supported by the exclusive patronage of Citroën. The pavilion, designed by Faust Finzi in 1912, has housed the nation’s artists for nearly a century. – J. Lindblad, with interview by Caroline Claisse. This entry was posted on Wednesday, June 1st, 2011 at 4:53 am	and is filed under AO On Site, Go See. You can follow any responses to this entry through the RSS 2.0 feed. You can leave a response, or trackback from your own site.